The Italian way of eating is about the enjoyment of quality genuine food and drink. The Italian way of eating is about the enjoyment of quality genuine food and drink. It is also about eating and drinking in a progression that will aid in proper digestion to enhance the overall experience. When it comes to Italian drinks, the most obvious thought is usually coffee or wine for which Italy is so famous. You would, however, miss out on a vast range of afternoon and evening drinks shared with friends or consumed to stimulate the appetite or add the perfect finish to a meal. Most of these drinks have an alcohol content that ranges between 15 to 55 percent. In America, these type of drinks are loosely referred to by the French words aperitif (aperitivo in Italian), digestif (digestivo), and liqueurs. These categories are broad and difficult to categorize, as lines blur with many drinks considered to stimulate the appetite, aid digestion, or simply be pleasurable to drink. Here is a brief look at some of these popular Italian drinks. Before lunch or dinner, an aperitif is a light alcoholic beverage such as a sparkling white wine or a somewhat bitter drink to get the digestive juices flowing. In Italy, aperitifs usually arrive with a savory nibble sometimes called salatini. These small bites might be potato chips or peanuts, or an array of tiny crustless finger sandwiches topped with cheese, fish or meat paste, at no extra charge. Usually, from about 4-7 p.m., especially in northern Italy and the larger cities, café bars have the Italian equivalent of happy hour called aperitivi, offering a selection of small bites to go along with your drink. Prosecco: A refreshing sparkling white wine, usually dry, whose main grape varietal "Glera" may have originated in the small village of Prosecco close to Trieste. Now the most well known brands of Prosecco come from the hills outside of Treviso in the Veneto and the Fruili Venezio Giulia regions. Bellini: A glamorous tall drink that consists of Prosecco, white peach purée, and a touch of raspberry for color. The bellini was created at the landmark Harry's bar in Venice's historic piazza San Marco. Vermouth: Vermouth is a name given to a present-day family of aromatic white, rosé, and red fortified wines. The aromatics are a variety of roots, spices, flowers and herbs. These drinks have a long Italian history, reaching back to ancient times and said to have fortified the Roman troops. There are a vast array of vermouth styles, most coming from either France or Italy. Generally speaking, the dry white vermouths are considered to be French; sweet red vermouth, Italian, but almost all vermouth producers make both sweet and dry varieties. When vermouth is sweet, Italy calls it bianco. The red varieties derive their color from caramelized sugar. Red vermouth was first created in Turin around 1786 by Antonio B Carpano, and quickly became a favored drink of the Savoy king and his court. There are some rosé varieties, but they are less common. Other styles and brands born in the Piemonte region are Cinzano, Gancia, and Martini and Rossi, just to name a few. This classic Italian aperitif is always served chilled, neat, or with a splash of sparkling water and twist of lemon. In the US, vermouth is usually served in mixed drinks, but it is experiencing a bit of a renaissance. Campari: A distinctively red colored, bitter aperitif made from an infusion of herbs and fruits. Most often served with sparkling water, white wine, or orange juice, this drink was invented in 1860 by Gaspar Campari, who began in Turin and then moved to Milan where he opened the now historic Caffè Campari -- a popular meeting place for artists such as Giacomo Puccini. Until 2006, the drink was colored with carmine dye, derived from crushed cochineal insects. Aperol: Similar to Campari, but lighter in color, half the alcohol content, and slightly less bitter. It is popular served with sparkling water. Aperol originated in 1919, and has since been bought by the Campari company, who now produces and distributes it. Crodino and San Bittèr: a non-alcoholic beverage similar to Aperol that came on the market in the 1960s. It's fair to say there really isn't a tradition of Italians drinking mixed cocktails. Most Italians prefer standalone drinks or very simple additions of sparkling water or juice. Martini: 8 parts gin and 2 parts dry vermouth, a perfect martini uses equal parts of dry and sweet vermouth. However, today's martinis tend to be drier with less vermouth. Garibaldi: 3 parts Campari to 7 parts blood orange juice, made in honor of General Garibaldi who helped unite Italy into the country it is today. The color of the Campari and oranges refers to Garabaldi's troops, who were called red shirts. Digestivi is a category also called Amaro or Amari, which translates to "bitter." These drinks range from dark herbal medicinal drinks to lighter, still bitter drinks that can be quite interesting. Their flavors are complex mixtures of herbs, roots, barks, berries, spices, flowers, and citrus peels. Most Italian families have at least one bottle of Amaro on a shelf and usually some homemade variety. These drinks are usually considered after-dinner drinks and often serve as an aid to digestion, but they are also offered as a welcome drink when a friend drops by. They are usually drunk at room temperature, and never all at once - instead, small shots that are sipped. Only a small fraction of the extensive range of digestivi have made it to America, as Americans don't embrace bitter flavor as commonly as in Italy. Try a few; you might find some of the flavors may grow on you as your palette expands. 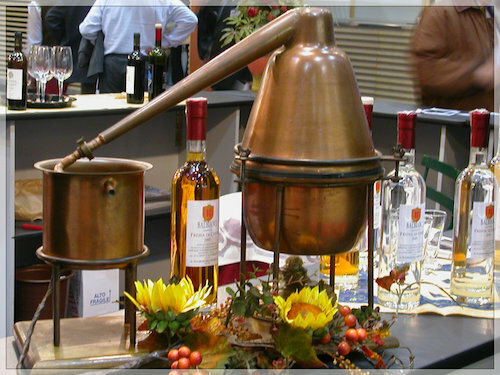 Grappa: A usually clear distillate made from the leftover pressings of grapes from wine making. Flavors vary depending on the types of grapes used. Grappas with a touch of amber color have been aged in barrels. The northern town of Bassano del Grappa has tried to lay claim to the origin of grappa, but there is no firm proof, as distillation has been common all over Italy dating back to the first century. This strong spirit is never sweetened and sipped at room temperature, or added to an espresso coffee (listed on a menu as caffé corretto, or corrected coffee). Often, after the customary after-dinner espresso has been drunk, a splash of grappa will be added to "wash" out the sugar left at the bottom of the cup. Genepi: An infusion of flowers from varieties of wormwood plants that only grow in the Alps of Piedmont, Val d'Aosta in Italy and France. It is an alpine drink purported to aid digestion and altitude sickness. It is usually served after a meal at room temperature, or with friends in small shots to be sipped. Fernet Branca: Probably one of the most recognizable and medicinal tasting of the Amaro category, Fernet Branca is dark colored with strong menthol flavor from a mix of peppermint and spearmint. It is a very flavor-forward drink and to my taste, not for the faint-hearted. It is made in Milan. Amaro Lucano: Hailing from Pisticci, Basilicata, this drink has a lighter color but still intensely herbal flavor, with what might be called a chocolate and root beer finish. Averna Amaro: An herbal-based amaro that is made more approachable with the addition of blood orange and lemon peel. It is made in Sicily. Ramazotti: Considered to be one of the more modern and popular brands of Amaro, ramazotti has a lighter balance of bitter and sweet, with a ginger flavor that stands out. It is made in Milan. Cynar: A lighter and flavorful bittersweet drink that is more approachable than many of the heavier, traditional amari. It has a lower alcohol content and artichoke as one of its 13 flavors. Limoncello: An intensely lemon flavored liqueur, most famously associated and produced from Sorrento, the Amalfi coast, and the island of Capri. Popular throughout all of Italy, limoncello is also often made at home from steeping lemon peel in grain alcohol until the oil is released, then sweetened with simple syrup. Limoncello is always served neat and icy cold. Strega: Strega translates to "witch" and comes from Benvenuto, Campania, a town that has long harbored legends of witches. Strega's characteristic yellow color comes saffron, and its sweet herbal flavor contains hints of mint and fennel among its purported 70 ingredients. It is usually drunk neat and is a key flavoring in Torta Caprese, a flourless almond and chocolate cake originating from the nearby island of Capri. Sambuca: A sweet, usually colorless, anise-flavored liqueur. It is made with the essential oils of anise, star anise, licorice, and elderflowers. It is said to have been based on an anise-flavored drink that arrived from the east to the the major port city of Cittavecchia in the Lazio region. It is served neat, as an after-dinner or coffee drink. It pairs well with coffee and sometimes used to sweeten espresso, in place of sugar. It is often served as a shot con la mosca, or "with the fly", with three coffee beans in the bottom of the shot to represent health, happiness and prosperity. Sambuca can also be lit to toast the occasion. Naturally, it must be extinguished and allowed to cool before sipping. Although most people don't usually think of beer when they think of Italy, there are two brands that have been around for about 150 years: Birra Moretti from Udine, and Peroni originally from Pavia and now produced in Rome. Craft beers have really blossomed over the past 10 years and beer is finally finding a larger following with a steady growth of small microbreweries springing up over many parts of Italy. You can find Baladin craft beer in the U.S., and surely there will be more to follow. Italian Aperitivi and Digestivi Drinks originally published on the Menuism Italian Food Blog.